Brazil. Espírito Santo, Aracruz, estrada para Santa Rosa, H. C. Lima, R. D. Ribeiro, C. E. Meireles & F. L. R. Filardi 6600 (holotypus RB). Brazil: Espírito Santo and Rio de Janeiro. Endangered (EN). After exhaustive work in herbaria collections and field expeditions, we discovered that Abarema limae occurs in less than five fragmented populations. This species has a few known mature individuals which inhabit the Atlantic Domain, an endangered tropical ecosystem in Brazil, and may be considered to face a high risk of extinction in the wild. Abarema limae resembles A. jupunba, but differs in the absence of leaflet indumentum on the abaxial leaflet surface, the leaflet size which is smaller in A. limae (1.8 – 2.5 × 0.7 – 1 cm) than in A. jupunba (1.5 – 2.5 × 0.8 – 1 cm); the glabrous ovary in A. limae; and the pod shape and size. Abaremalimae is also similar to A. barnebyana, but differs mainly in leaflet size and shape, bigger in A. limae than in A. barnebyana (1.1 – 1.4 × 0.6 – 0.8 cm), with an acute apex. 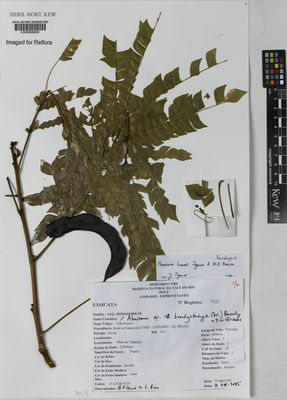 The species epithet honours the Leguminosae taxonomist Haroldo Cavalcante Lima, collector of the type specimen.